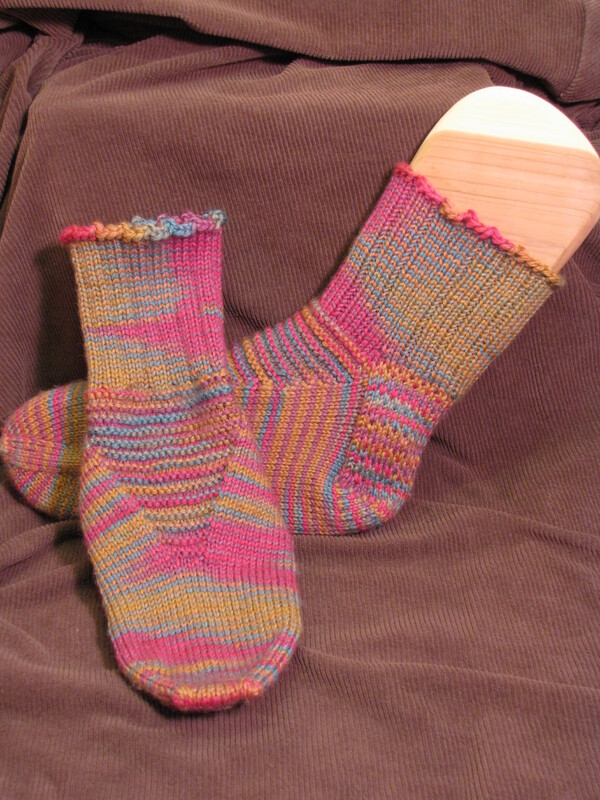 Like the first pair, these are knit from Lorna’s Laces Shepherd’s Wool, which is a worsted weight yarn. (Ravelry calls it aran.) This gorgeous colorway is darker and richer in person, but I’ve still not gained control over my new camera to the point of getting true colors in most of my pix, especially when it’s gray and spring drizzly outdoors. I used the Purple Iris colorway, and it’s gorgeous! 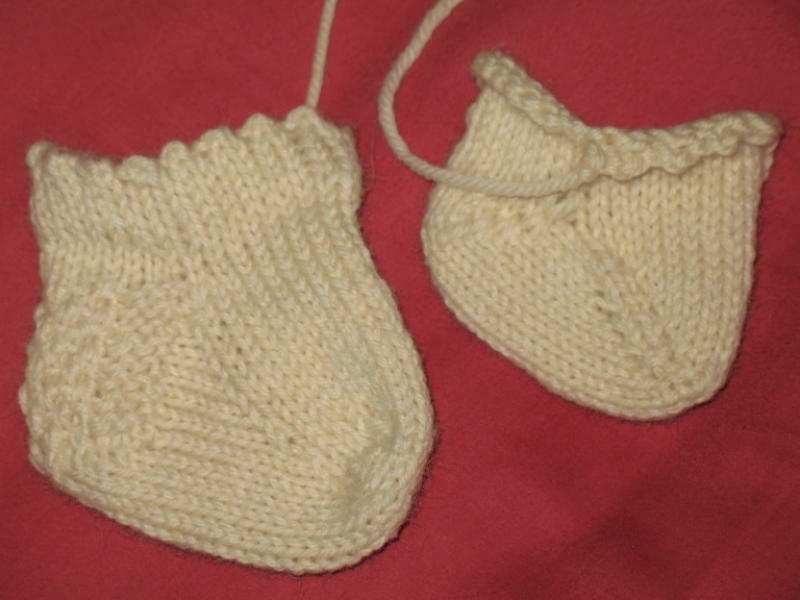 It took about 1.35 skeins to make these, but she has 10.25″ feet with a 9.5″ midfoot, so not small socks. 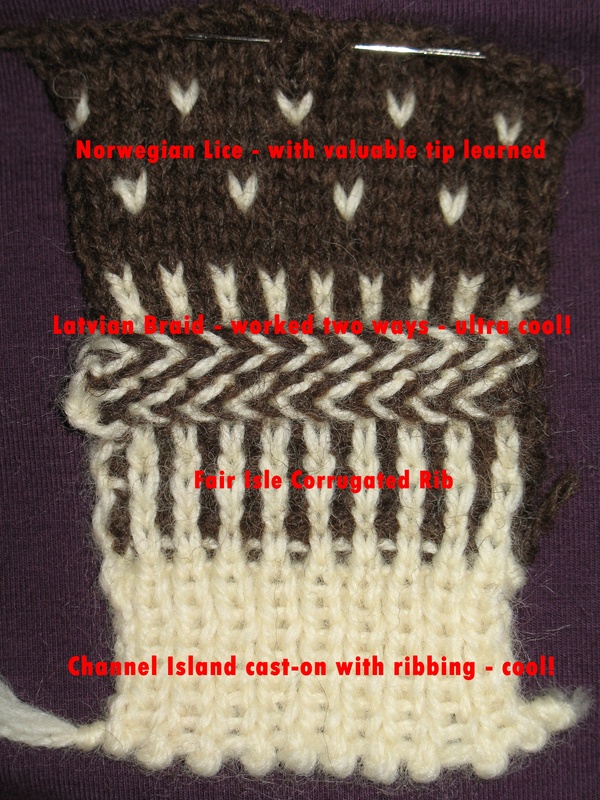 The pattern is again from Cat Bordhi’s New Pathways for Sock Knitters. 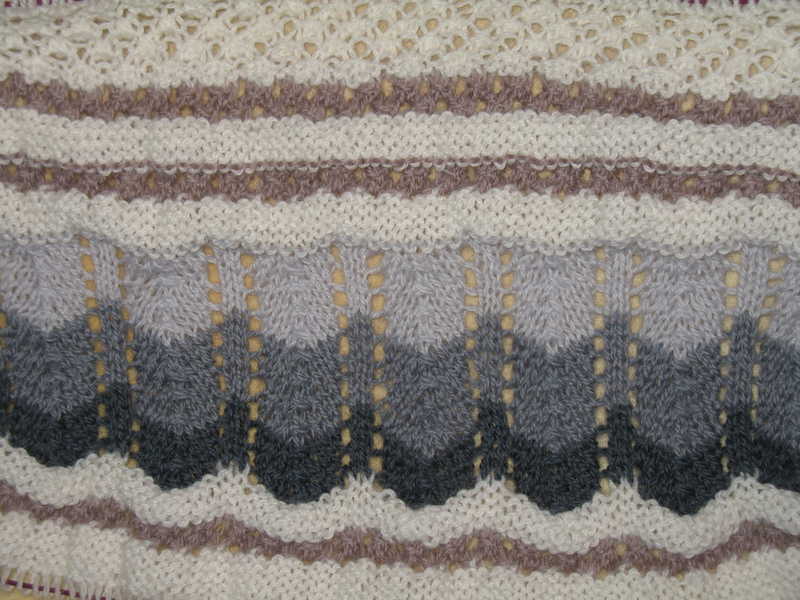 I was going to just use the Riverbed Master pattern, then succumbed to Rushing Rivulets – a slight variation to Riverbed, in that Cat provides a very simple lace pattern to work on the instep. This is not a pattern for someone who can’t read their knitting! To begin, the lace is worked on the original half of the stitches that form the instep, but the increases on this pattern are on the sole, and as they are worked, the original sole stitches begin to become instep stitches, though they remain on the sole needle. 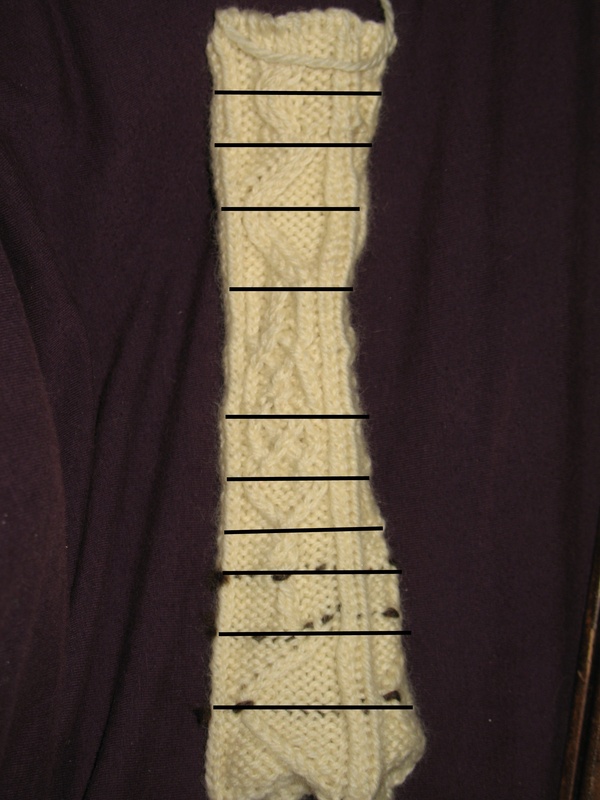 It’s important to keep track of how many stitches belong on the sole and to expand the lace on each side, wrapping it around as it’s knit – all this while also keeping track of which rows receive increases. It’s not impossible, but not good first pattern, either. I found it well worth the effort in the end, though! Oh, and here’s the Ravelry link if you need it. I can’t believe I’ve not finished the half written post I’ve had all week! I still need to do it soon, but since I’ve promised to blog at least once each week this year, and I’m not possessing a lot of time at the moment, I’m just going to share my current, unexpected knitting frenzy – socks! What’s unexpected is that although I have 3 pairs of socks on my goal list for this year, those are socks for me, and these are socks for someone else. The irony here is that I adore my hand knit socks, but I’m not fast at knitting them, nor have I managed to become addicted to the process yet, so I have exactly two pairs to my name. I wash one while wearing the other – not always easy to manage, but my feet are spoiled rotten, and they don’t like me when I put those Walmart things on them any more. 😦 Under these circumstances, the LAST thing I ever expected was to be making socks to give away. However… well… when my daughter was home on furlough, she sort of gave me this look… then picked out some yarn… and now I need to make socks for her, which I’m calling her birthday gift, and I need to get them done quickly! Thankfully, she wants thick, warm, smooshy, colorful socks, so she chose worsted weight yarn in fun colors. Silly me, though… I thought I could whip up a pair on Sundays during the Ravelympics! Did I mention I’m a VERY slow sock knitter? And I’m still not quite ready to think about what happened during the Ravelympics yet! This past week, I realized these socks really need to be done quickly, beings as I’ve already missed her birthday and will be seeing her fairly soon, so during the week, the first pair went from being toes to socks, and the second is following quickly in their footsteps, while I do little else but knit and catch up a bit from February. These are knit from Lorna’s Laces Shepherd’s Worsted Multi in the Watercolor colorway. We have large feet in our family, so I ended up using a little more than a full ball of yarn, making me glad I bought two. With an average sized foot, I suspect one would have been plenty, but when you are knitting for a 10.25″ foot with a 9.5″ midfoot circumference, it really eats up the yarn! I used Cat Bordhi’s Upstream Master Pattern with a standard toe, except I did my increases two stitches in from the edge instead of just one, in order to produce a somewhat deeper toe box. When I started the arch expansion increases, I used purls for the second companion row between the increases rather than knits. The heel is Eye of Partridge, which I think looks really nice in this yarn, the ribbing is 3×1, since she wants these primarily as bed socks and I didn’t want them to be overly tight. I used Jeny’s Surprisingly Stretchy Bind-off for the first time on a pair of socks, and I’m quite pleased with the results. 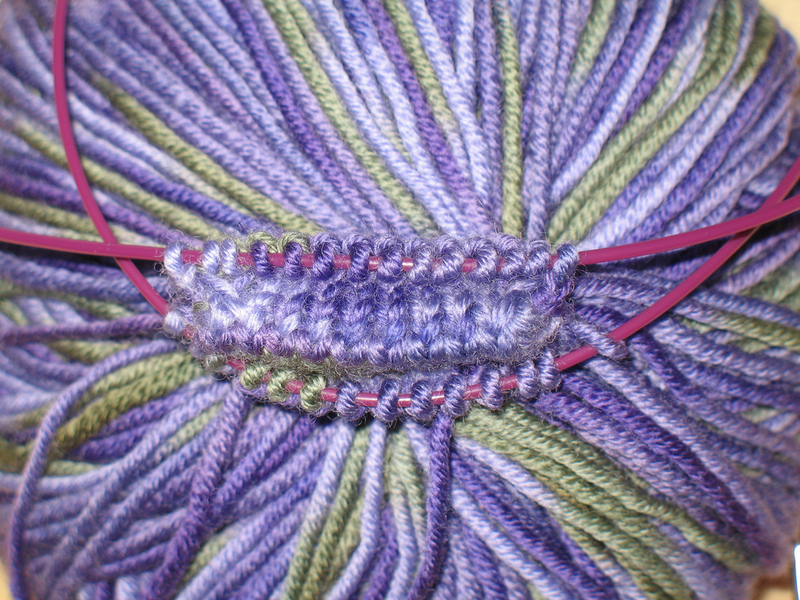 With this heavier yarn, it gave a sweet ruffled look to the top edge, and I like it a lot. I’m hoping in a few days to have a second completed pair of socks to share, but for now, I’ll just show you the toe picture I took a couple days ago.You will also note that I’m doing two socks on two circs. Although I don’t enjoy this nearly as much as I enjoy working with DPN’s, I’m realistic enough to know this is likely the only way I’ll actually get them both done before my deadline, and at least I don’t have to think the pattern through twice this way. The increased speed from that probably counters the frustration I have from spending so much time trying to keep my needles and two ends of yarn from the same ball from tangling… I hope! Anyway, I mentioned this because I wanted to point out that Cat’s book does not share info on knitting socks two at a time. If you want to use one of her fantastic patterns two at a time, you can make it work, but you should expect to learn the technique somewhere else. Her book is written for both circs and DPN’s, just not details on two at a time. I’ve had these pix for a couple of days, but I’ve been too busy to get them posted. The day after the storms last weekend, it was sunny out, and the sky was an impossible blue. Not surprisingly, I simply had to snap a few more pix with this delightful third background. 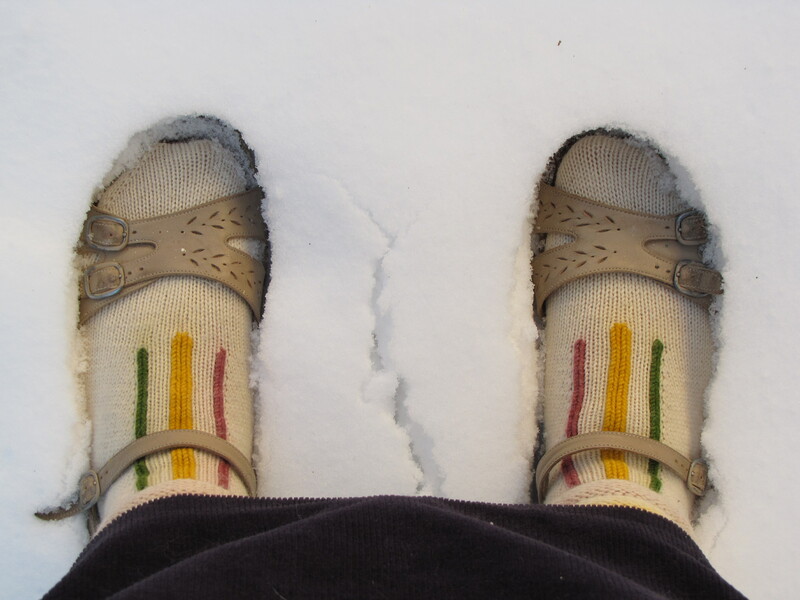 I’ve been wearing my Changeling Socks a lot this winter, and absolutely loving them. 🙂 These are the socks I made under a bit of duress. My students wanted to make socks, and I wasn’t in the mood, but I didn’t tell them that. Instead, I bought some Wendy Guernsey wool from Schoolhouse Press and made the project a bit more fun by dyeing some of it to accent my socks. I started out with a KAL, but quickly decided that they just weren’t going to fit me correctly, so somewhere in the midst of the overly pointy toe, I reverted to Cat Bordhi’s Ridgeline pattern, which, of course, was a perfect fit – if you don’t look at the toes, that is. 😉 The pattern change is what inspired me to name them Changeling Socks, one definition of changeling being something that changes from one thing into another. What you can’t see is the bubbled, peekaboo ankle stripes. More pix here on Ravelry. One additional comment on the socks… If you noticed a little spare color bleeding into the white, I rushed the dye job, and I suspect now that I didn’t nuke it quite long enough, and possibly didn’t rinse them thoroughly. If that wasn’t enough, the second time I washed them, I didn’t splash any vinegar into my rinse water. They don’t look quite as sharp now, but they are still delightfully warm and comfortable. A man waved me ahead of him at the bank when I was running rather late. I started my second series of lace knitting classes at my LYS (an hour away) teaching students’ choice of Concerto or Symphony to 10 lovely ladies – good company, knitting, teaching, and income all rolled into one! I got a Subway meatball marinara flatbread for supper – and they had plain Sunchips! I got my first spontaneous compliment on a handknit shawl from a total stranger – and a potential 11th student at the same time! When my Goals support buddy (aka dear friend Joy) came up with the brilliant idea of tracking our goals in a pocket planner, I immediately added one to my shopping list to pick up after class. Shortly after walking into my LYS, though, Arlene asked if any of us could use one of the pocket planners she’d been given – and one of them was green, no less!!! 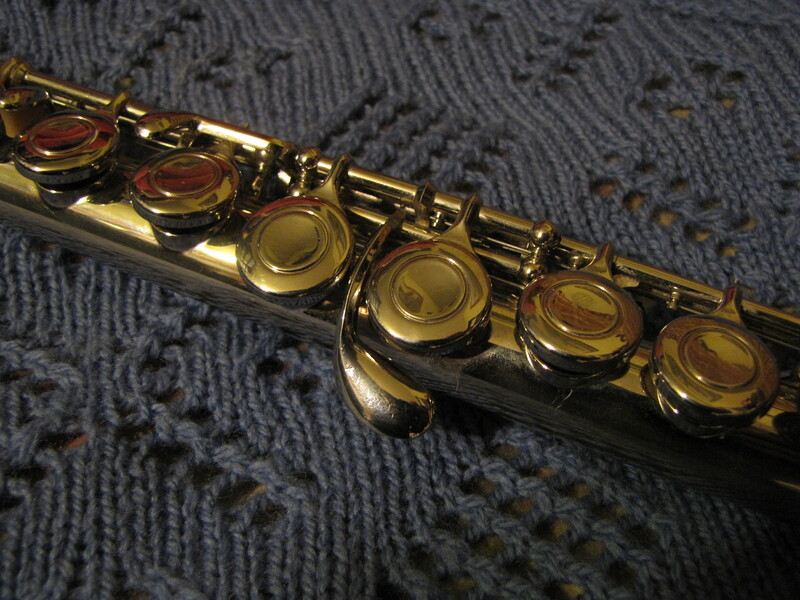 And… I got a magic flute! Okay… It’s not really magic – not the way most people would define that word, at least. For me, though, it’s total magic! You see, I’ve wanted a flute ever since I was 10 years old. 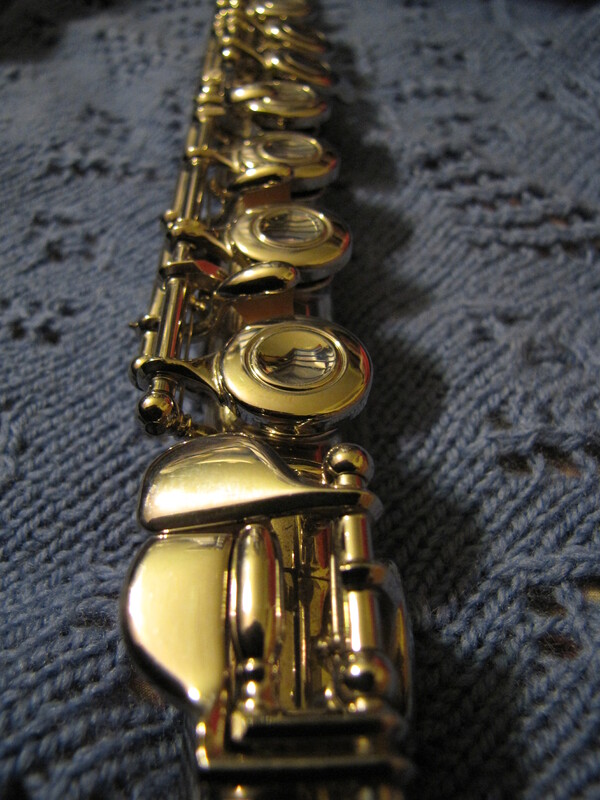 I absolutely adored playing the flutophone back in fourth grade. It had been a required class for us, and for me it was a head over heels in love experience. I still l have my (totally unchewed) flutophone, and I’m not above getting it out to play four decades after my last class. I wanted to join the school band and play the flute in the absolutely worst way, come fifth grade, but my parents refused to let me, citing the very non-marchable piano in the living room, which, my mother claimed, would provide me with far more useful skills in the long run. From this side of history, I’m not sure that the skills of learning a very solitary instrument was as advantageous to me as being part of the social structure provided by the school band would have been, and although I still enjoy playing the piano, it’s never been a heart and soul sort of thing for me. I don’t regret my (very limited) piano playing skills, but to this day, I truly feel they should have allowed me a second instrument, especially since the spark of my passion never really waned. A few years ago, it suddenly dawned on me (duh! 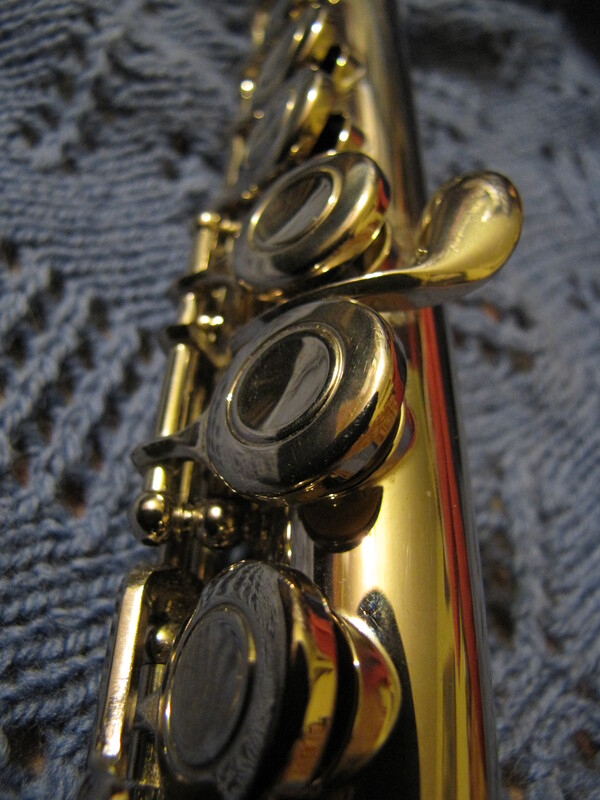 ), that there wasn’t a reason in the world I couldn’t still learn to play the flute. I’d bought 4 different recorders, a tin whistle, and a Native American flute in the meanwhile, but had somehow relegated my flute to the fantasy file. Then one day I had the opportunity to handle an antique ebony and ivory flute, and my heart fluttered, fanning the embers of my dream into a full fledged bonfire. After checking the prices, though, I decided I’d best relegate it to my Christmas list. For three years, it was totally ignored by my entire family. Then, after a third disappointment a week ago, I had another one of those lightbulb moments. Craig’s List + Christmas money! Within minutes, I found one I could afford listed in Dayton, which was convenient, since I was going to be teaching up there again starting this week. A quick phone call to set things up left me sitting and staring dumbly at the calendar, wondering how I was going to bear the 4 day wait until Monday! 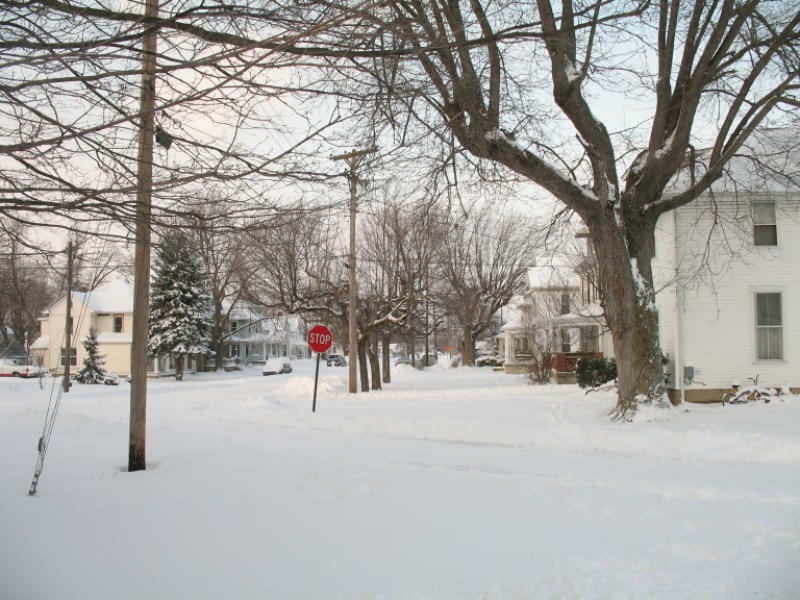 Happily, I survived the wait, and between my afternoon and evening classes, I braved the snow and went to complete my very first Craig’s List transaction. Believe me, it was difficult to focus on my students for the second class with my brand new flute laying on the table beside me! On the other hand, can you believe that Arlene’s husband was in the store helping with inventory, and it turns out he used to play the flute?! After class, he gave me a few pointers to get me started, and with a bit of experimentation tonight after I got home, I managed to play Mary Had a Little Lamb without too many extra squeaks and whistles. The picture directly above shows why my little finger is now totally exhausted. There sure is a lot for it to do on these three keys! As for that New Year’s goal about making music for at least as few minutes each week? Week one – accomplished and logged in my new pocket planner. I had a wonderful day! Goals Post – Forward to 2010! Perhaps this post should be titled “Living in Dreamland.” 😉 It’s unquestionably the most ambitious list of goals I’ve ever set out at the beginning of the year, and I’ve not ever completed my shorter lists, but my philosophy of goals remains that having a higher target means I hit more, even if I don’t complete them all. The most important factor for me is to remain realistic in that I remember it IS an overly ambitious list, and that anything I do accomplish is a victory; it’s not a defeat to not do all of it. These are goals to help me stay on track, not requirements that identify whether I’m a worthwhile person! Finish the interior and/or exterior of Friendship Cabin, a Real Good Toys Adirondack Cabin that we started several years ago, but which has languished untouched since sometime before the beginning of 2009. Here’s the album where I chronicled our first days working on the project. 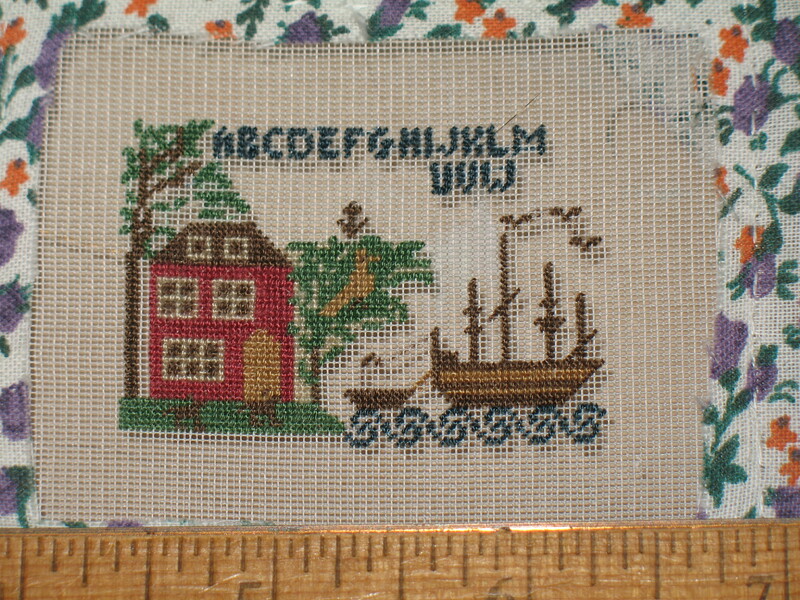 Finish my Teresa Layman Cottage By the Sea project – actually barely started, and a massive project for someone who really doesn’t like embroidery or French knots. 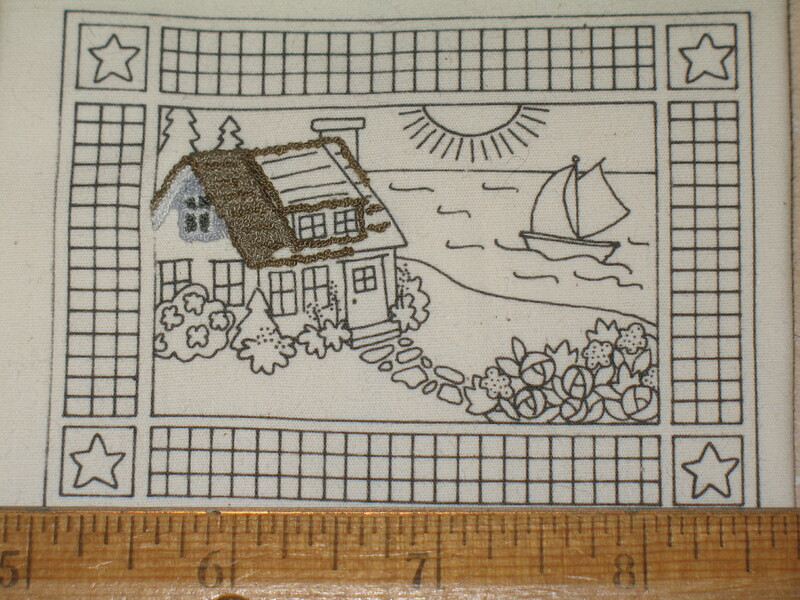 This will be a rug for Friendship Cabin. Publish at least 4 knitting patterns – should actually be more than this, as I have 3 projects that just need the paperwork part of this goal in order to be ready. The paperwork is the hard part of course… I’m knitting my next shawl design right now, and I’ve promised another KAL for the spring, so I’m going to be busy with this! 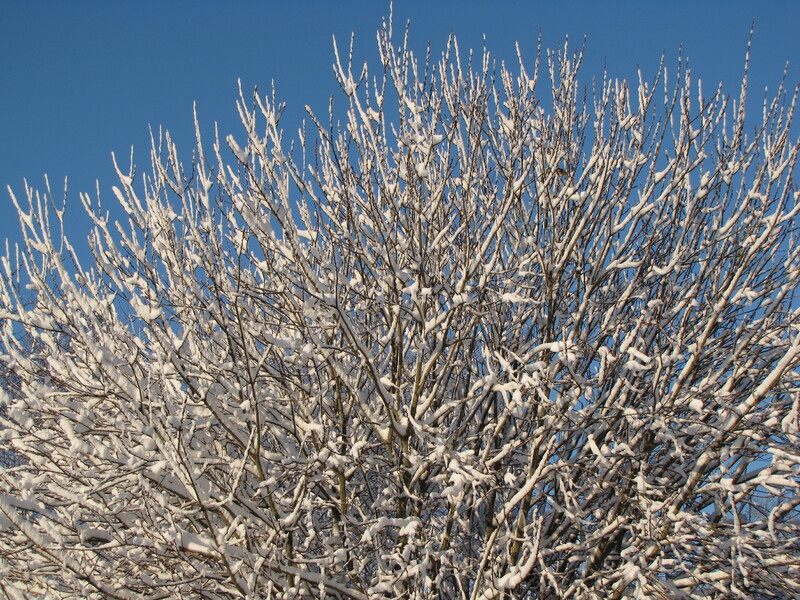 Finish my spinning wheel – I can’t believe this sat untouched for an entire year. Where on earth did the time go??? The staining is about half done, but it’s an involved project. Once that’s done, I need to finish and assemble it. Knit a project from wool I’ve cleaned and spun, using a pattern I’ve designed – I have a bit of a jumpstart on this, as I’ve cleaned a goodly pile and picked some of it already. Make another 2 pairs of socks for myself (maybe I’ll get the next done before I wear holes in what I have?) This was one pair until a friend twisted my arm and said I should try for two – and one pair has to be top down, to boot! Bad thing here is that I also promised a pair to my daughter, so this means three pair this year, when I’ve never done more than one. Gulp! 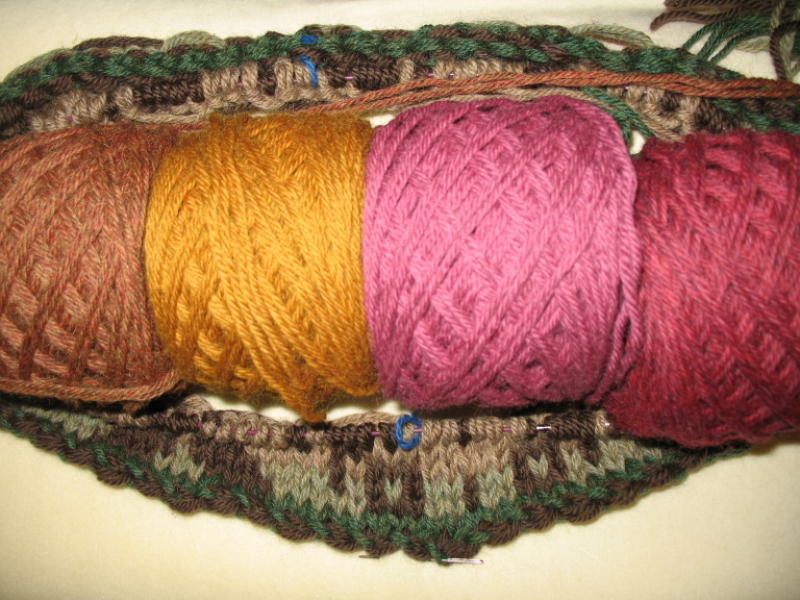 Finish at least 3 of the projects currently languishing in my WIP/UFO tubs – items started before July 1, 2009. This one will also be a challenge. I love the stuff in my UFO tub, even though it’s all pretty good at inducing guilt. 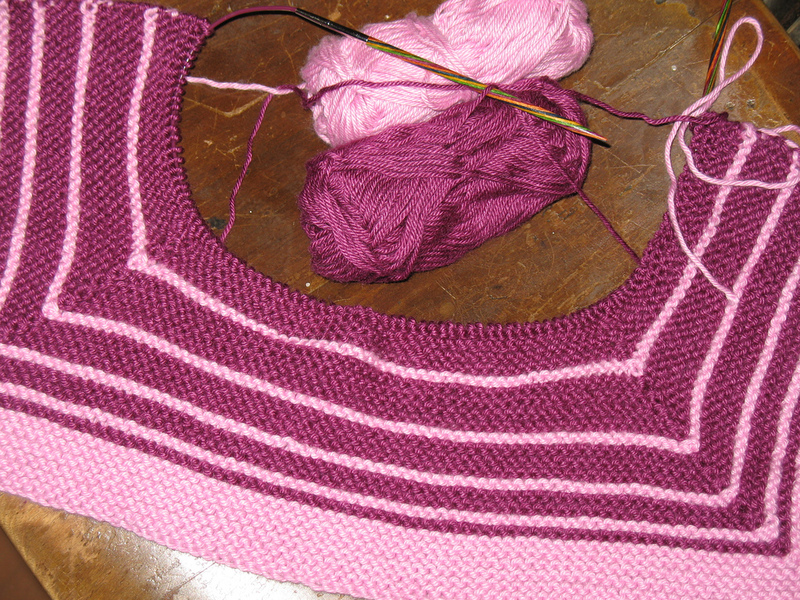 I’ve found that designing really slows down the knitting, though, especially on other people’s patterns! Finish at least one of the remodeling projects… sigh… Acceptable candidates are the kitchen (which is in the impossible dream category), painting the door to my future studio (easy), or finishing the nook, laundry room, or my sewing room. Nook and laundry room both depend on hubby – most especially the nook – though I have a load of work to do in those two areas, too. Spend at least a few minutes every week making music – LOVE doing this, but I’ve really ignored this part of my life for the last few years. 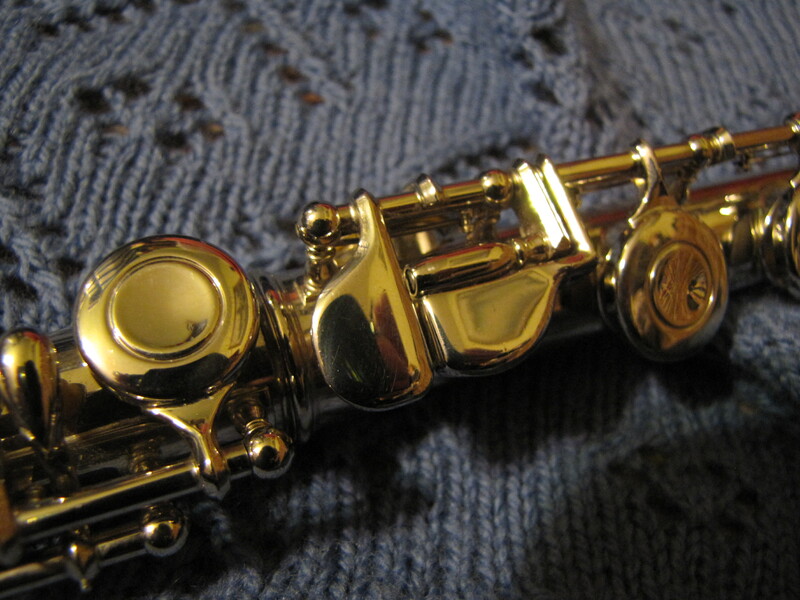 Looking for a flute – like I need more instruments around here? Learn my new camera – for starters, needing to know why I can’t take a decent close up with a camera that cost this much! Finish Reba – poor thing! Her sisters were finished in 2006 (pix in this album) but my teacher suddenly stopped classes with Reba just one firing away from being done. Every attempt I’ve made to get her fired since then has ended in failure. 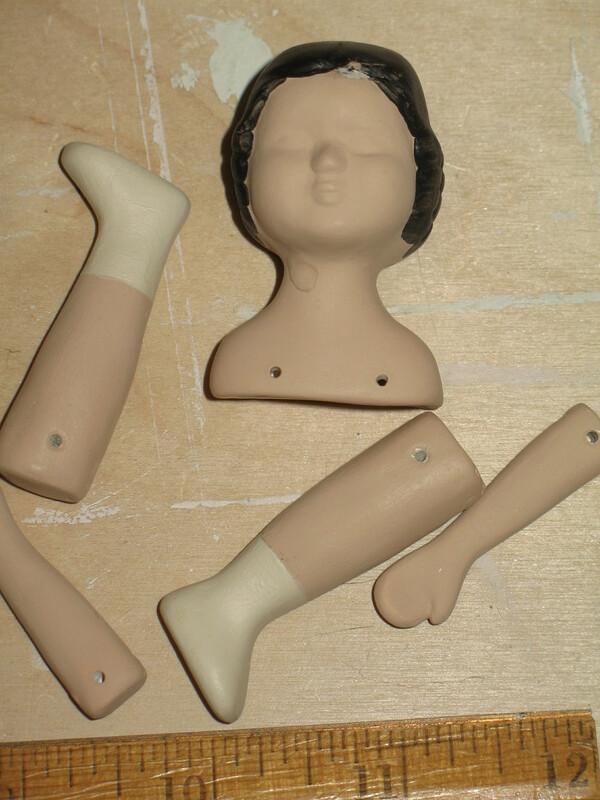 Need to get a kiln up and going here so I don’t have to depend on anyone else. Make a pair of socks on my CSM – This could be anything from amazingly easy to a terrible headache, based on things I’ve heard. First task is getting the new needles and such that I need. Probably crazy, but I joined a Navajo style weaving Yahoo group, and now I have the bug to weave something, even if it’s small. I’m torn between tri-loom and Navajo style, but would adore trying both. One item is enough to qualify. Move one of my dolls from hospital patient status to display status – maybe Aaron, so he can show off his adorable knitted romper? He is on this page. End the year 25 pounds lighter than I started it. Why is this so hard?! Go somewhere new – state or country. I have a life goal of visiting all 50 states and all 7 continents, and I need to keep at it if I’m going to succeed! Clean out one of my email accounts – frighteningly big project, but I’ve made a lot of progress already in the first two days of the year. It’s amazing how quickly this can fall behind again, though. Get the treadmill inside – Sounds like no big deal, but it’s going to need cleaned up, and the area where it belongs is packed solid with things that don’t belong where they are – which aren’t where they belong because their spots are filled with stuff that doesn’t belong where it is, which… well… you get the idea! You know that sweet Bessie Pease Gutman picture of the little girl standing in the corner? She looks too angelic to have ever done anything wrong, but there she is, proving that it’s possible to look good and still be up to mischief. Obviously, my “Kathy’s Socks” are cut of the same cloth, as it were. 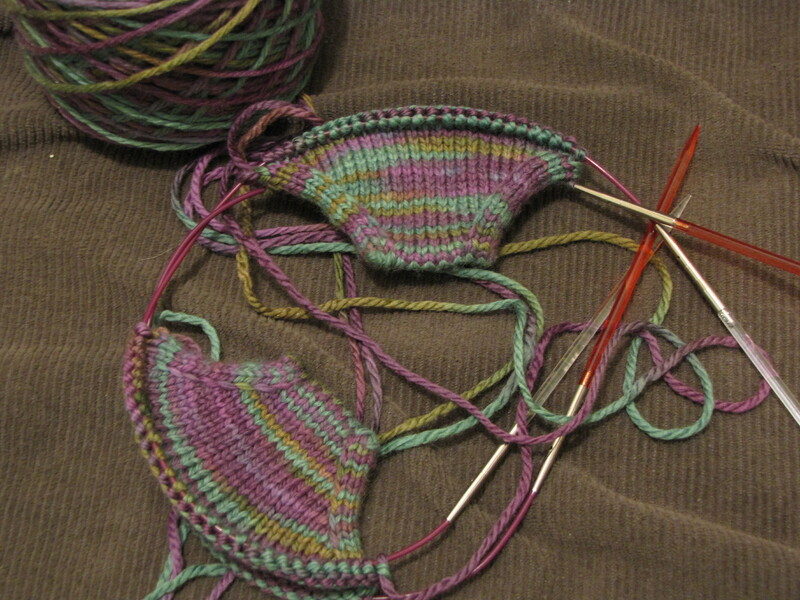 Considering how fanatical I was about watching for yarnovers between needles, I was in total shock to see these two “interesting” design elements, which had been on the back side of my right foot, and escaped notice when I tried it on several times earlier. But thinking back and looking at where they are, I know how it happened both times. I’m more than a little unhappy about ripping out nearly the entire foot, and I’ve had enough experience ripping these tight cables to know that getting everything back on the needles isn’t going to be fun. I have also realized rather ruefully that by the time I get my first sock finished, I will have already knitted nearly two whole socks. I know… I could leave the holes. Problem is that they would drive me crazy, and I could never enjoy wearing the socks. Why do something this nicely detailed then leave two glaring holes? It would seem that having a range instead of a specific number for toe length isn’t necessarily a good idea for a first time sock knitter, knitting a pair of socks that feel as if they are cursed. They are plenty long to be grafted and there are still 8 rows to go. I could live with that, as it feels like they would form around my toes nicely even at this width. 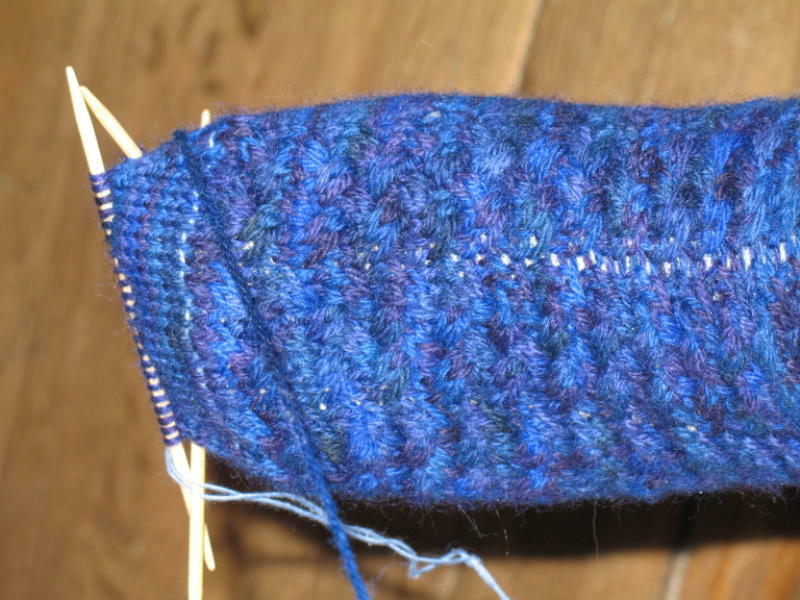 However, with the stockinette toe starting halfway up my big toenail, it looks more like I got tired of making cables or something – totally silly. Obviously, these socks have it in for me. I love them – so long as I’m not knitting them at the moment. I do want to finish them. However, I’ve been working on one sock for 6 weeks now. This is feeling not only excessive, but very trying. Everyone talks about how wonderful socks are because they are so quick to knit. Everyone hasn’t made this sock apparently. I’m officially putting these in time out, and I’m starting a toe up pair with different yarn (much lighter color, so easier to work) and a totally different pattern (Coriolis), and they are custom designed with my personal measurements, thanks to Cat Bordhi. But isn’t that invisible cast on toe great?! 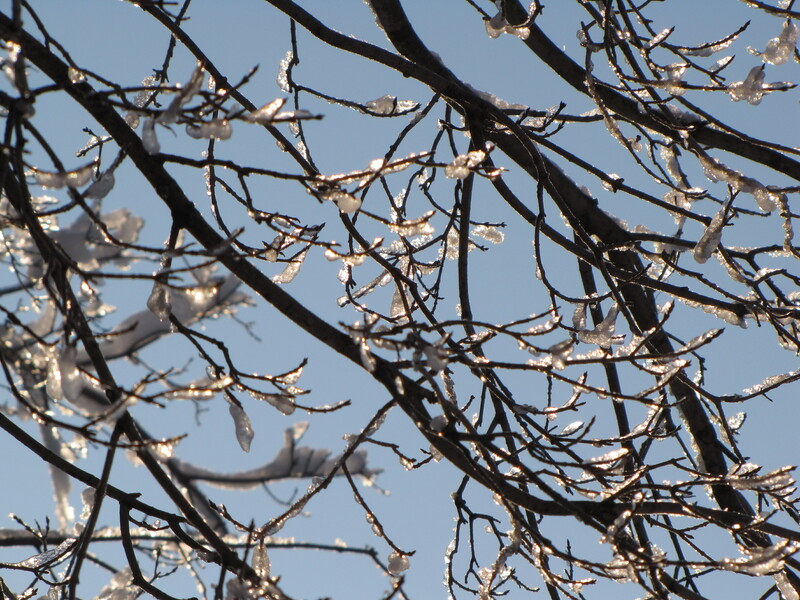 Under the Wire – Hurrah! I got a phone call the middle of last week saying that I was now officially on the class list – and was given a list of supplies to bring. I couldn’t believe I was unable to come up with a skein of worsted weight yarn without making a trip to Wal-Mart, but since I had to go see the dentist anyway, I didn’t have to make a special trip out at least. The trip that was not so nice was the drive to Dayton on Saturday morning in pea soup fog all the way. I definitely recommend Charlene’s workshops if you have the opportunity to attend. She is a gentle and pleasant teacher who isn’t of the “one right way” school. She has the aura of a good doctor – you know, the sort that makes you feel as if you are his only patient and he has all the time in the world to tend for you. And I think it might be tough to go to one of her workshops for the first time and not learn at least one thing new. I also enjoyed the fact that I was suddenly facing some techniques I’d been putting off trying, and had no excuse not to attempt, especially with expert help at hand to bail me out, and a project that wasn’t something for real. 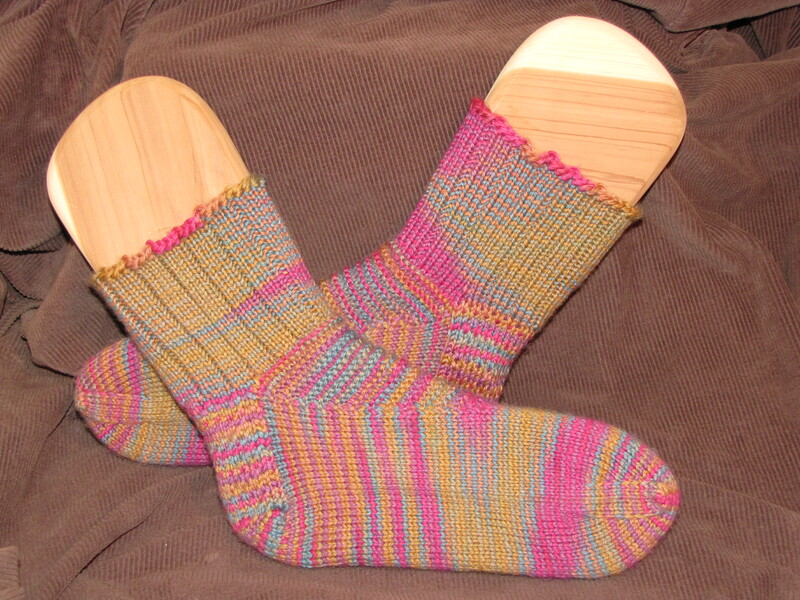 What we made in class is a pair of sample socks – and I’m using the term “pair” rather loosely here. For that matter, “socks” is somewhat loose, too! As you might imagine, one sock was toe up and the other was top down. 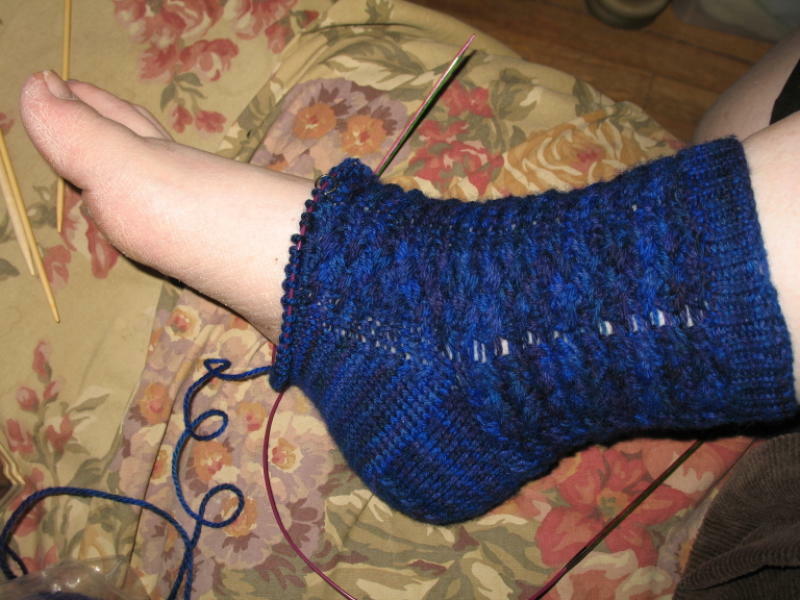 The focus was not on the areas of the ankle and foot that are worked straight, so most of us birthed somewhat odd looking bits of knitting as we worked cast ons, heels, and toes one right after another. 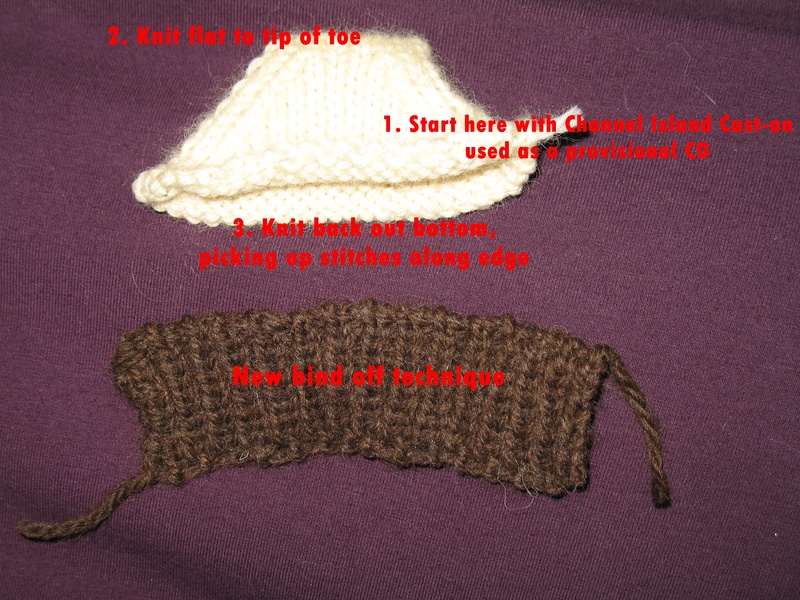 On the top down sock, we could choose to either rib the top or make a picot edge. Since I have no problem with ribbing and flexible cast ons, I opted for the picot, which I’d never tried. 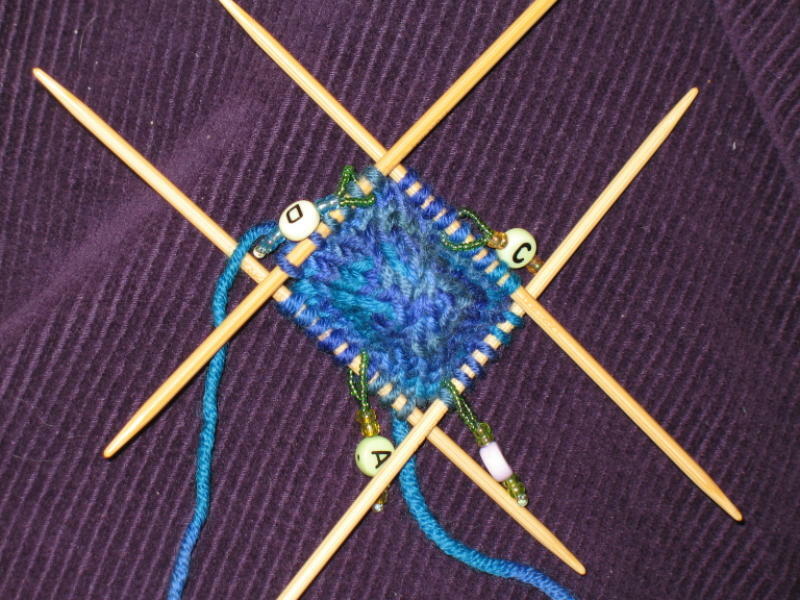 I got off to a rough start, having to frog 2-3 times before I got going right, and it has nothing to do with the difficulty of a picot edge and everything to do with trying to knit when I’m usually asleep, right after driving for 90 minutes in heavy fog. Once I got going, I did fine, and I didn’t have any trouble again except when I was interrupted halfway through my Kitchener stitch and laid it down… sigh… We did heel flaps on the top down and short row heels on the toe up socks, experienced Judy Becker’s Magic Cast On for the toe ups, and played with not one, but four flexible bind offs when we reached the top. I love the picot bind off, and I’m eager to try it on a ribbed edge. I didn’t have time to work any ribbing on my practice sock, so the edge rolls, which could be a great design element on the right item. Charlene says it doesn’t roll on ribbing, so I know it’s going to find its way to the top of a pair of socks sooner than later. If you look at the smaller of the two socks, it has all four options, and the picot is the one that shows on the part of the edge toward the toe. 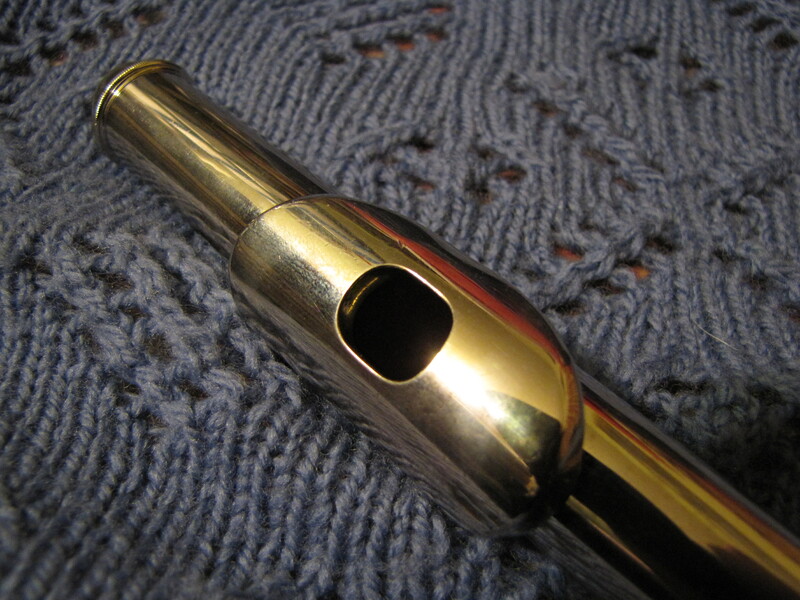 If you would like to try knitting it yourself, click here: Picot Bind Off. As an added bonus, Charlene stayed in town for Monday’s guild meeting, and presented a lecture on the history of socks. If she’d had that info in printed form, I’d have purchased it on the spot! Very interesting, in my opinion, and I wish I had a way to reference it in the future without digging through the list of sources she rattled off as providing her information. Charlene has authored a number of very popular books. Her two sock books are designed to enable a knitter, so instead of just having patterns for specific socks in certain sizes, she includes techniques and charts and oodles of pattern stitches, and all the help you need to build your own perfect socks. If you are the sort of person who would rather learn how to fish instead of being handed a fish, check out Sensational Knitted Socks and More Sensational Knitted Socks. If it wasn’t already a sock heaven sort of weekend, we also got to paw through a delicious mountain of her sample socks, knit for her books… Yum! 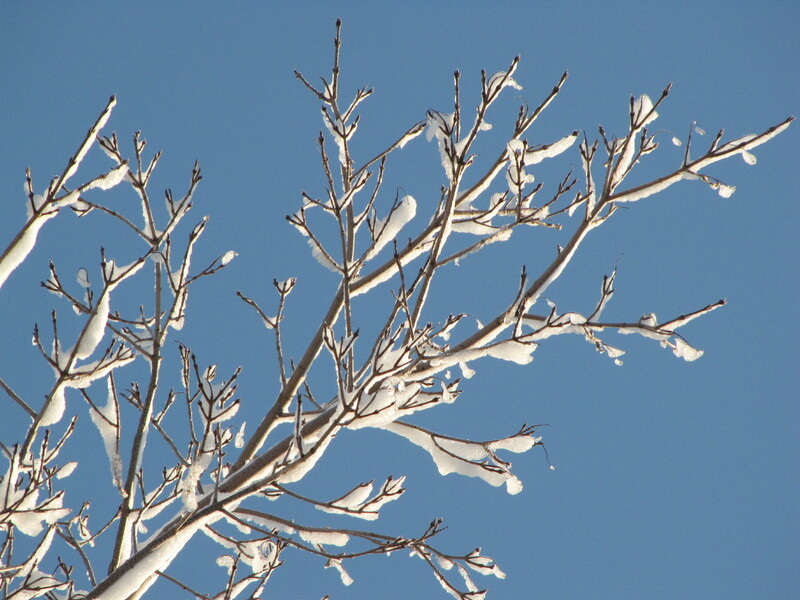 It started out with the blizzard last weekend – a term not loosely employed. Here we are, comfortably into March, and for the first time in the 25 years we’ve lived here, the National Weather Service issued a legitimate blizzard warning for our county. 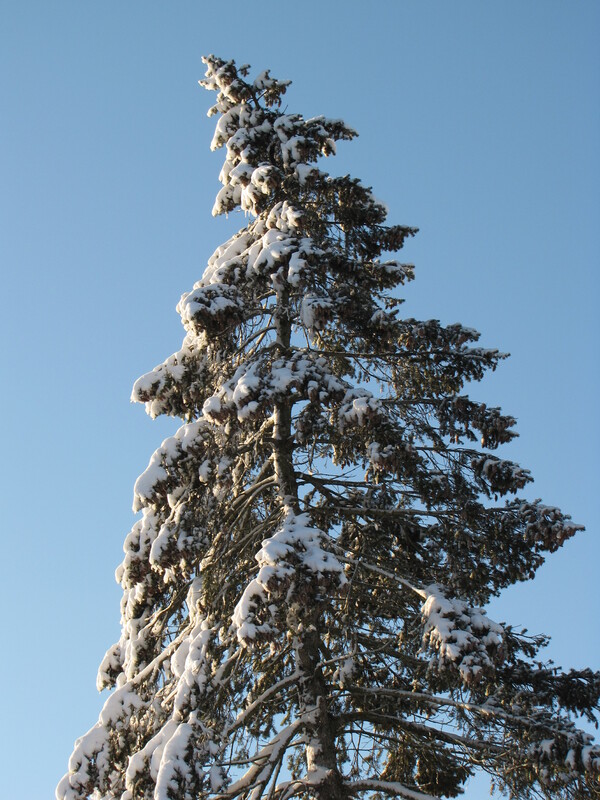 We didn’t get as much snow as the next real town to the north of us, but it was enough – with the obligatory wind and biting cold. We’ve not had much of a real winter here, but now that it’s in its death throes, it apparently has decided to make a bit of a fuss. One good thing is that it was so bitterly cold that the flakes were quite small and dry. 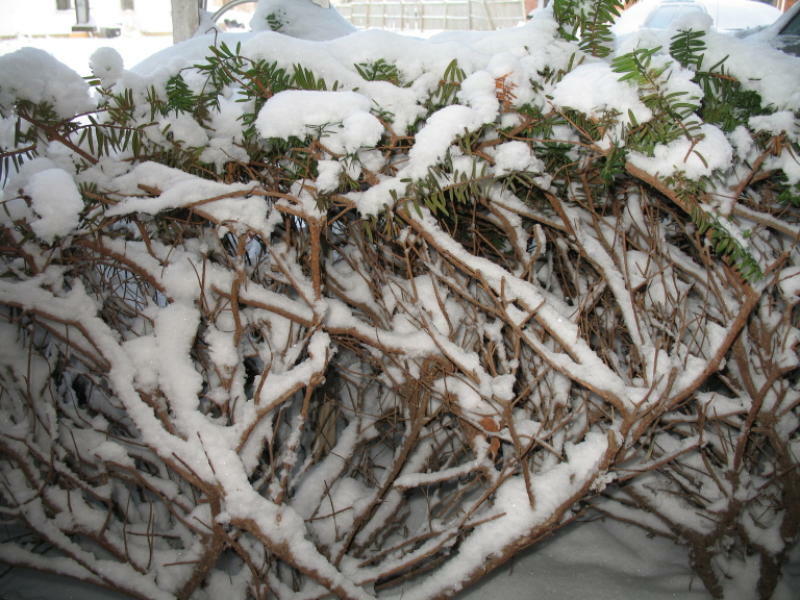 They didn’t hang in the branches and prune the trees for us, but they did make some lovely drifts. Once the worst of things had settled, Hitty Darlene was eager to go exploring the marshmallow fluff world outdoors, and she had a lovely time of it. Other excitement has been as diverse as a trip to the dentist, getting into a great workshop for which I’d been waitlisted (and needing to obtain supplies post haste), and being invited by a friend to go on a special cruise (complete with research and decision making, and registering before the Saturday cut off), which will fill one of my 100 Things to Do Before I Die dreams. I’m absolutely convinced that 2008 is not going to be a boring year, and to this point in time, I’ve only had maybe one or two days that could even begin to wear that description. On the knitting front, progress continues everywhere and then some, as I flit amongst four very active projects, depending on the amount of time available and my ability to concentrate. I have started to work the lace on the next to last scallop on my capelet, then it’s the rush up the side and across the top, then done. Goal was to have it ready to take to Monday night’s meeting, but I’m questioning the likelihood at this point. It’s addictive, as is Outlander, which is my current audiobook, reserved only to be read while knitting, but I have to do other things occassionally, too, like my commission project, which had to be started over, as I wasn’t at all happy with it the first time. My first sock is inching steadily down the sole to the toe, but I only put four rows a day on that, so it’s slow going. At least it fits this time. 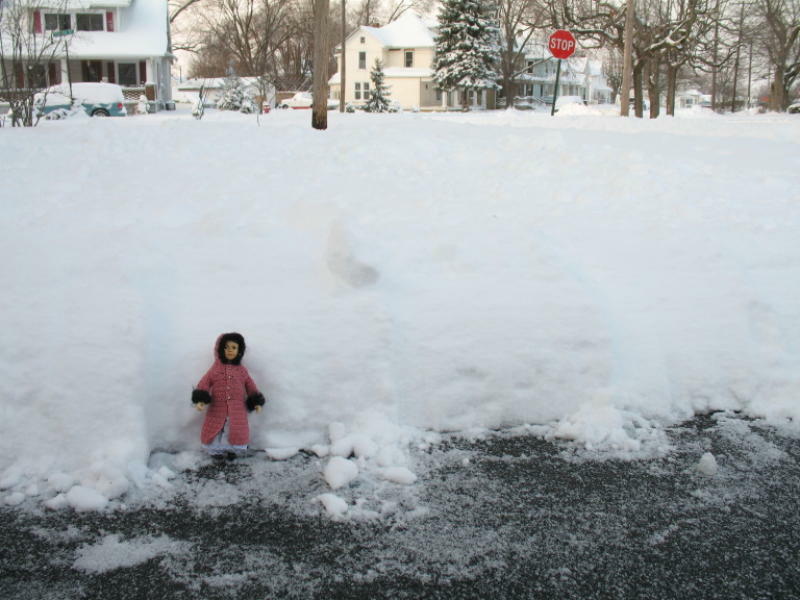 This photo was taken about 3 inches ago. 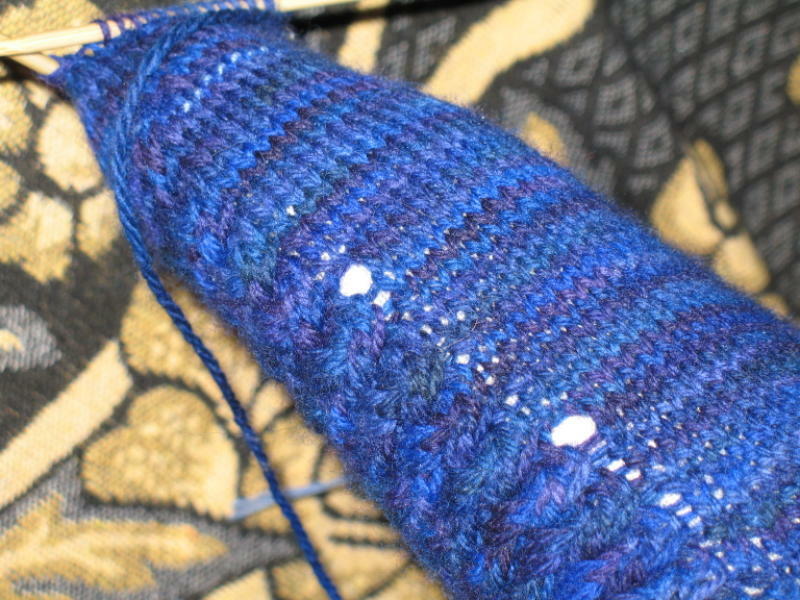 I love looking at the way the stitches shape the heel and gusset. It almost looks like magic. And my pre-born projects finally got the best of me. I have several chomping eagerly at the bit, but had been able to resist the next shawl and the socks, due to having one of each on the needles. Next sock projects are probably Cat Bordhi’s Coreolis and Red Bird’s February Sock of the Month (in that order, as I’ve seen plenty of cables to last me for a while). 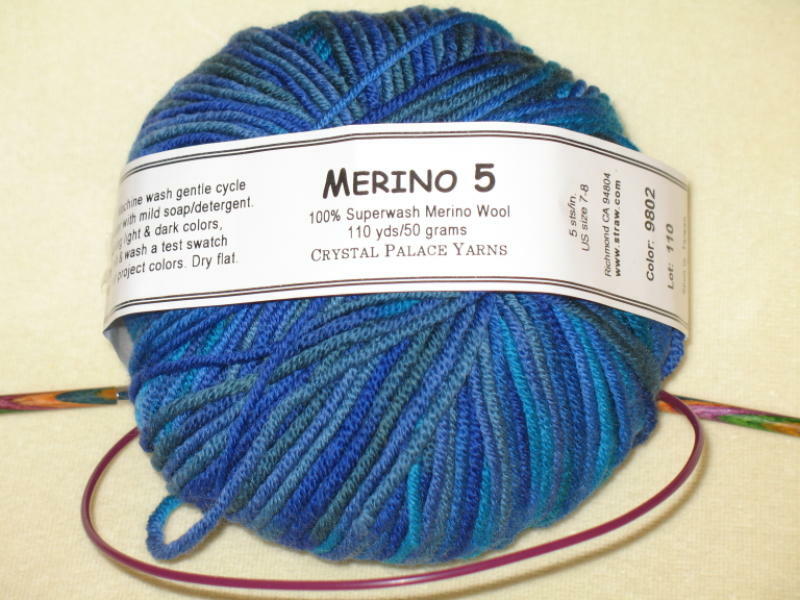 It turns out that both are in yarn that is primarily blue – just like my first sock. Hmmm… How did I do that, I wonder? 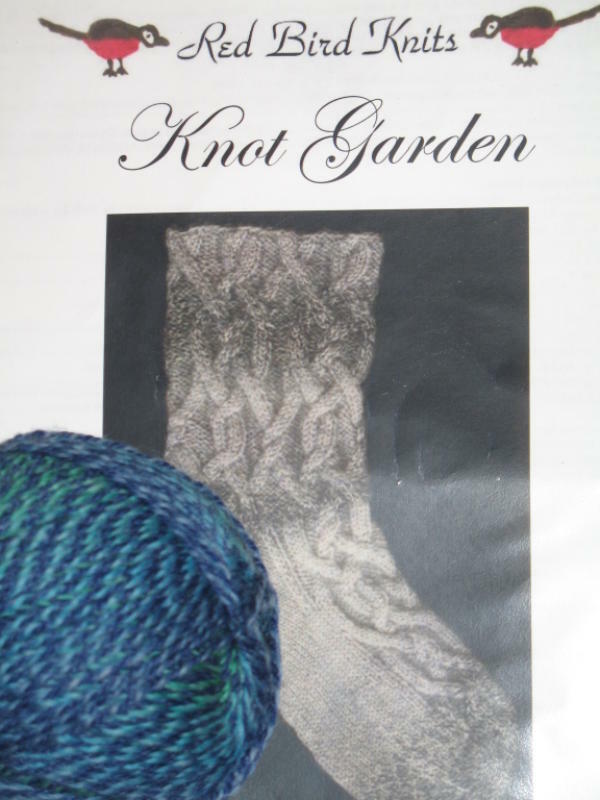 At least the Knot Garden by Red Bird Knits was accidental. That’s the yarn that came with it, and I didn’t know what I’d be getting until I opened the package – honest! But this other project is a little different, combining inspiration from Vicki Square’s Folk Bags and a pattern from Alice Starmore’s Book of Fair Isle Knitting, to hopefully successfully fill a need for a special container to hold the things I need at hand when I’m hanging out on the sofa. Here is the start of it – or rather, the second start of it. I’m beginning to get the hang of working with one color in each hand, and it’s almost as addictive as the lacework, but I’m making every effort to keep it a very low priority project until I’m done with my commission work. Since the work is done with strands of worsted weight (Knit Picks’ Wool of the Andes), it goes along very quickly when I do have a few minutes to invest. Looking at the photo, the colors don’t appear to blend as well as they do in person, so we’ll have to see what happens as I work the rest of them into the project.